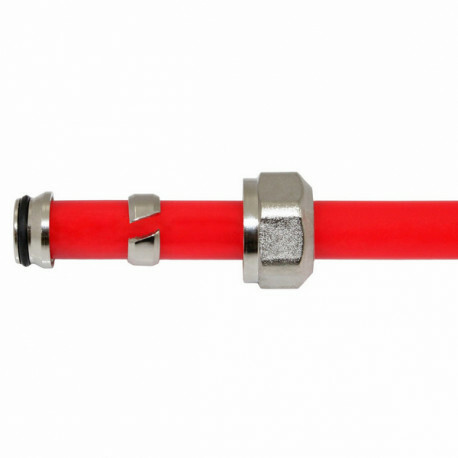 1/2" PEX Compression adapters are used to connect 1/2" PEX tubing to the SSM or BSM series radiant heat manifold's outlets. Compatible with all types (A, B, C) and makes of 1/2" PEX tubing manufactured to ASTM F876/877 and SDR9 standards (Everhot, Watts, Viega, Zurn, Nibco, etc.) Not for use with PEX-AL-PEX - use SSM212 instead. No PEX tools are required to connect the PEX tubing to the manifold. Instead, use adjustable pliers (such as Channellocks) or a crescent wrench to tighten the nut over the manifold's outlet. 1/2" PEX adapters are included with every radiant manifold set and do not have to be purchased separately. If you need any other size adapters listed on the website, leave a note at the checkout - they will be changed at no additional charge.